Back view of sunburned woman. Obese lady on the beach. How to deal with sunburn. Female Hand applying sunscreen creme on Leg. Skincare. Sun protection sun cream, on her smooth tanned legs. Mother applying sunblock cream on son back at beach. Attractive girl in red swimwear applying body lotion on sensitive skin to protect the skin and prevent aging from the sun. Sunbathing on the exotic resort near pool side area. Portrait of attractive woman in red body swimwear spreading body lotion on tanned skin. Sunbathing on the exotic resort. 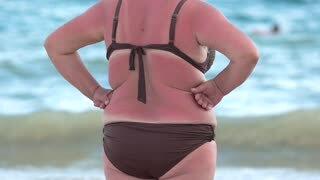 Attractive girl in red swimwear applying sun cream on tanned skin to protect the skin and prevent aging from the sun. Sunbathing on the exotic resort near pool side area. Pretty young tanned blonde woman in bikini on the sand beach. Buttering her body with suntan oil. Close-up: Man is sitting on beach on sun lounger. Raises his hand, makes the sun shade. Starts to talk about the weather. Squinting.